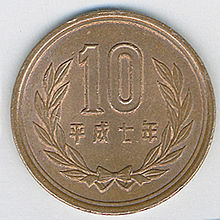 The 10 yen coin (十円硬貨, Jū-en kōka) is one denomination of Japanese yen. The obverse of the coin depicts the Phoenix Hall of Byōdō-in, a Buddhist temple in Uji, Kyoto prefecture, with the kanji for "Japan" and "Ten Yen." The reverse shows the numerals "10" and the date of issue in kanji surrounded by bay laurel leaves. 10-yen coins issued between 1951 and 1958 have reeded edges, while 10-yen coins issued from 1959 onward do not. The following are circulation figures for the coins that were minted between the 4th, and the 43rd year of Meiji's reign. Coins for this period all begin with the Japanese symbol 明治 (Meiji). Patterns that include the rare 1870 dated coin are not included here. The following are circulation dates which cover Emperor Hirohito's reign. The dates below correspond with the 26th to the 64th year (last) of his reign. All ten yen coins that were made before 1959 have reeded edges, this has since changed to the present day smooth edge. Coins for this period will all begin with the Japanese symbol 昭和 (Showa). "Emperors name" → "Number representing year of reign" → "Year" (Ex: 昭和 → 三十四 → 年). "Emperors name" → "Number representing year of reign" → "Year" (Ex: 平成 → 十 → 年). The following are circulation dates for the future Emperor. Crown Prince Naruhito's accession to the Crysanthemum Throne is expected to take place on May 1, 2019. It is unknown if the new coinage will be marked with a 元 symbol (first) on the coin as a one year type. Coins for this period will begin with the Japanese symbol 令和 (Reiwa). ^ a b "10 yen coin". Bank of Japan. Archived from the original on 2010-11-06. Retrieved 2008-10-03. ^ a b "Japan 10 Yen Y# 12". Numismatic Guaranty Corporation. Retrieved March 27, 2019. ^ a b c d "Japan 10 Yen Y# 12a". Numismatic Guaranty Corporation. Retrieved March 27, 2019. ^ "10円青銅貨" (in Japanese). www.buntetsu.net. Retrieved March 27, 2019. ^ a b c d e f g h i j k l "Japan 10 Yen Y# 33". Numismatic Guaranty Corporation. Retrieved March 27, 2019. ^ a b "年銘別貨幣製造枚数" (PDF) (in Japanese). Japan Mint. Retrieved March 25, 2019.